Imagine a frozen world where heat itself has become a commodity and an incurable disease runs rampant, cutting a swath through the scattered population of an Earth which is suffering through its second ice age. That’s the premise behind Frostbite, the latest offering from Vertigo Comics, a company which seems to be going through something of a renaissance in 2016, churning out bold, daring and thought-provoking books at an almost dizzying pace. After an attention-grabbing opening (which you can experience in all its glory in the preview pages below), the issue unfolds slowly, gradually establishing the world these intriguing characters inhabit, if not necessarily the characters themselves. 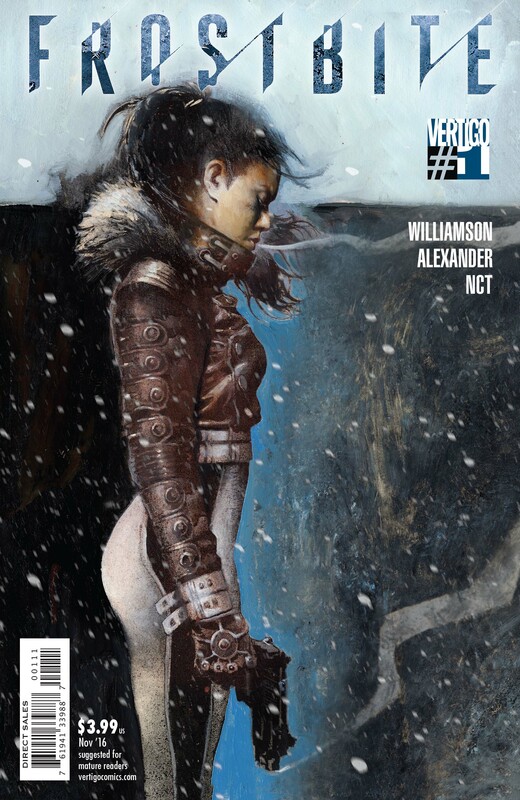 Williamson shows a steady hand delivering the exposition, but for the most part, there’s no escaping the fact that it initially feels like fairly formulaic, post-apocalyptic science fiction, prompting a growing sense of concern during the opening pages that the series wouldn’t manage to capitalise on its truly mouth-watering potential. As it turns out, I needn’t have worried. Midway through the issue, the story is given a jolt of energy and a renewed sense of purpose as the real scope of the series is unveiled. Yes, there may be nods to all manner of established science fiction tropes along the way, but Williamson blends them in such a way as to keep things feeling familiar without ever seeming derivative. The main characters are suitably intriguing – if a little under-developed for the time being – and the moral dilemma (or lack thereof) of one particular character provides the lasting memory of the issue long after the reader has put the comic down. Oh, and it definitely doesn’t hurt that the artwork here is provided by Jason Shawn Alexander, most recently seen showcasing his gifts on Image Comics series Empty Zone. Alexander taps into the gritty, worn-down nature of the fractured society with his harsh, scratchy style, and seems equally at ease with tense character moments as he is with fraught, explosive shootouts. After a bit of a shaky start, this first issue sinks its hooks in impressively, painting a rich, vibrant picture of a world on the brink of destruction, and a population doing whatever they have to in order to survive. Williamson is always at his best when he’s allowed to gradually develop his own world, and in Frostbite, he may well have crafted one of his most impressive works to date. Raw, tense, violent and utterly chilling, Frostbite is a well-timed science fiction series with a razor-sharp edge. Highly recommended.